"ProFlicker is a fully customizable effect which can be used over and over again," said Christina Austin - CEO of Pixel Film Studios. With ProFlicker from Pixel Film Studios users now have the ability to simulate lens flicker effects with total control over overall look and feel, leaving room for endless possibilities, all within FCPX. Users have total control over color, blend modes, shape, amplitude, speed, noise, and more. 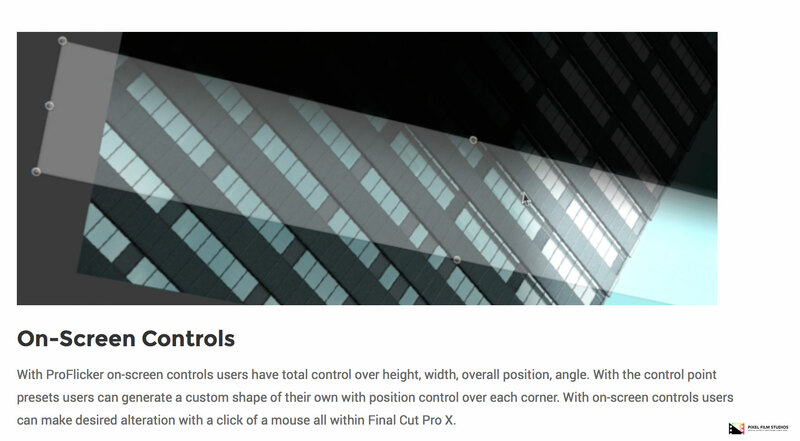 With easy to use on-screen controls users can alter the overall position, angle, height, width, and custom shape points with a click of a mouse. 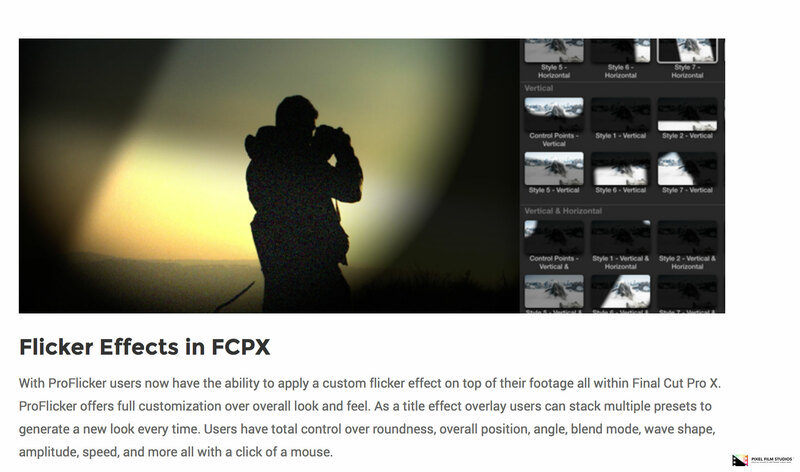 With ProFlicker users now have the ability to apply a custom flicker effect on top of footage all within Final Cut Pro X. ProFlicker offers full customization over overall look and feel. As a title effect overlay users can stack multiple presets to generate a new look every time. Users have total control over roundness, overall position, angle, blend mode, wave shape, amplitude, speed, and more all with a click of a mouse. 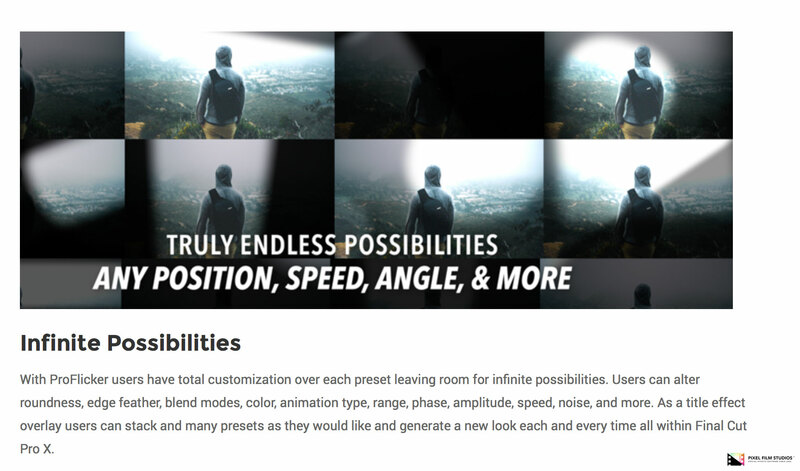 With ProFlicker users have total customization over each preset leaving room for infinite possibilities. Users can alter roundness, edge feather, blend modes, color, animation type, range, phase, amplitude, speed, noise, and more. As a title effect overlay users can stack as many presets as they would like and generate a new look each and every time all within Final Cut Pro X. With ProFlicker on-screen controls users have total control over height, width, overall position, and angle. With the control point presets users can generate a custom shape with position control over each corner. With on-screen controls users can make a desired alteration with a click of a mouse all within Final Cut Pro X.
Professionally designed to work seamlessly inside of Final Cut Pro X as an effect. Each ProFlicker preset can be dragged and dropped onto media and previewed in real time. With the published parameters found in the FCPX inspector, users have the ability to make further adjustments with just a few clicks of a mouse.